Love this series and I desperately want a fire spider. Five hundred years ago, Johannes Gutenberg discovered the art of libriomancy, allowing him to reach into books to create things from their pages. Gutenberg’s power brought him many enemies, and some of those enemies have waited centuries for revenge. Revenge which begins with the slaughter of two teenaged werewolves in the northern Michigan town of Tamarack. I am taking this to the Calgary Bookcrossing meeting to find a new reader. Picked this up at March's meeting. Another great meeting with 9 people in attendance including two newbies. Adding this to my to be read shelf. Great book, I love this series. I really love all the characters and wish they were real and could come to our BookCrossing meetings. Issac's love of reading is contagious and it made me love books that much more. Based on how this ends I am guessing there is another book, I really want to read it!!!!! Taking to the BookCrossing meeting today, it should go home with a reader. Taking to the May meet up for the "Useful or Unusual books" theme! My husband keeps saying "Do you have to keep reading???" YES! Now I need to read the next one. Minerva - a fire spider might accidentally scorch your wonderful birds! Can't believe I waited this long to read these two books. Picked up this book at the Calgary BookCrossing July meet-up. And book two because I know book one will be good. Lena's backstory still bothers me. 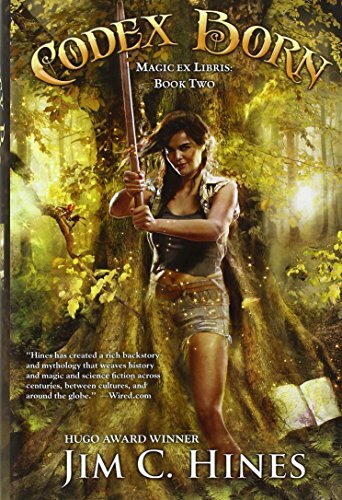 Sure, the author tries to explain it away by saying she was written by a terrible writer who wanted to write about shapely warrior women slaved to their emotions, but it's still weird. I continue to love the references to the shows I enjoy; Lena mentions an Eleventh Doctor quote in passing (from the episode "A Christmas Carol" if anyone is curious). The ending sets up an interesting twist and I'm curious to see where the series goes from here. Finished this book and went straight to the library to get the next two book of this series! Picked up the second of this series too at the January Calgary BookCrossing meetup. Didn't think I had my name in this one but it sounds like fun!